On Saturday 29 June 2019 from 14h00 to 19h00. 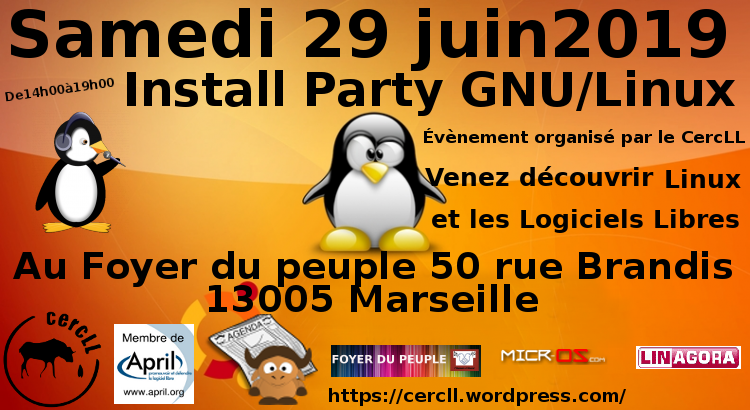 L’association CercLL (CercLL d’Entraide et Réseau Coopératif autour des Logiciels Libres) vous invite à une install party GNU/Linux, le samedi 29 juin 2019 de 14h00 à 19h00, dans la salle du Foyer du Peuple 50 rue Brandis 13005 Marseille. On Saturday 26 October 2019 from 14h00 to 19h00. L’association CercLL (CercLL d’Entraide et Réseau Coopératif autour des Logiciels Libres) vous invite à une install party GNU/Linux, le samedi 26 octobre 2019 de 14h00 à 19h00, dans la salle du Foyer du Peuple 50 rue Brandis 13005 Marseille. On Saturday 30 November 2019 from 14h00 to 19h00. L’association CercLL (CercLL d’Entraide et Réseau Coopératif autour des Logiciels Libres) vous invite à une install party GNU/Linux, le samedi 30 novembre 2019 de 14h00 à 19h00, dans la salle du Foyer du Peuple 50 rue Brandis 13005 Marseille. On Saturday 21 December 2019 from 14h00 to 19h00. L’association CercLL (CercLL d’Entraide et Réseau Coopératif autour des Logiciels Libres) vous invite à une install party GNU/Linux, le samedi 21 décembre 2019 de 14h00 à 19h00, dans la salle du Foyer du Peuple 50 rue Brandis 13005 Marseille. On Saturday 23 February 2019 from 14h00 to 19h00. On Saturday 26 January 2019 from 14h00 to 19h00. On Thursday 24 January 2019 from 19h30 to 23h45. On Thursday 27 December 2018 from 19h30 to 23h45. On Thursday 13 December 2018 from 19h30 to 23h45. On Saturday 24 November 2018 from 14h00 to 19h00. On Thursday 22 November 2018 from 19h30 to 23h45. On Thursday 8 November 2018 from 19h30 to 23h45. On Thursday 25 October 2018 from 19h30 to 23h45. On Thursday 11 October 2018 from 19h30 to 23h45. On Thursday 27 September 2018 from 19h30 to 23h45. On Thursday 13 September 2018 from 19h30 to 23h45. On Saturday 30 June 2018 from 14h00 to 19h00. On Saturday 26 May 2018 from 14h00 to 19h00. On Saturday 28 April 2018 from 14h00 to 19h00. On Saturday 31 March 2018 from 14h00 to 19h00. On Saturday 24 February 2018 from 14h00 to 19h00. On Saturday 27 January 2018 from 14h00 to 19h00. On Saturday 16 December 2017 from 14h00 to 19h00. On Saturday 25 November 2017 from 14h00 to 19h00. On Saturday 28 October 2017 from 14h00 to 19h00. On Saturday 30 September 2017 from 14h00 to 19h00. On Saturday 2 September 2017 from 10h00 to 18h00. On Saturday 1 July 2017 from 10h00 to 18h00. On Saturday 24 June 2017 from 14h00 to 19h00. On Saturday 10 June 2017 from 10h30 to 17h00. On Saturday 3 June 2017 from 10h00 to 18h00. On Saturday 27 May 2017 from 14h00 to 19h00. On Saturday 6 May 2017 from 14h00 to 19h00. On Saturday 6 May 2017 from 10h00 to 18h00. On Saturday 29 April 2017 from 14h00 to 19h00. On Saturday 1 April 2017 from 10h00 to 18h00. On Saturday 25 February 2017 from 14h00 to 19h00. On Saturday 4 February 2017 from 10h00 to 18h00. On Saturday 28 January 2017 from 14h00 to 19h00. On Saturday 7 January 2017 from 10h00 to 18h00. On Saturday 17 December 2016 from 14h00 to 19h00. On Saturday 3 December 2016 from 10h00 to 18h00. On Saturday 26 November 2016 from 14h00 to 19h00. On Saturday 5 November 2016 from 10h00 to 18h00. On Saturday 29 October 2016 from 14h00 to 19h00. On Saturday 15 October 2016 from 10h00 to 17h00. On Saturday 1 October 2016 from 09h30 to 12h00. On Saturday 24 September 2016 from 14h00 to 19h00. On Sunday 11 September 2016 from 10h00 to 18h00. On Saturday 3 September 2016 from 10h00 to 18h00. On Saturday 30 July 2016 from 14h30 to 19h30. On Saturday 2 July 2016 from 10h00 to 18h00. On Saturday 25 June 2016 from 14h30 to 19h30. On Saturday 4 June 2016 from 10h00 to 18h00. On Saturday 28 May 2016 from 14h30 to 19h30. On Saturday 7 May 2016 from 10h00 to 18h00. On Saturday 30 April 2016 from 14h30 to 19h30. On Saturday 2 April 2016 from 10h00 to 18h00. On Saturday 26 March 2016 from 14h30 to 19h30. On Saturday 5 March 2016 from 10h00 to 18h00. On Saturday 27 February 2016 from 14h30 to 19h30. On Saturday 6 February 2016 from 10h00 to 18h00. On Saturday 30 January 2016 from 14h30 to 19h30. On Saturday 23 January 2016 from 09h00 to 13h00. On Saturday 9 January 2016 from 10h00 to 18h00. On Saturday 19 December 2015 from 14h30 to 19h30. On Saturday 5 December 2015 from 10h00 to 18h00. On Saturday 21 November 2015 from 14h30 to 19h30. On Saturday 7 November 2015 from 10h00 to 18h00. On Saturday 31 October 2015 from 14h30 to 19h30. On Saturday 10 October 2015 from 09h00 to 13h00. On Saturday 26 September 2015 from 14h30 to 19h30. On Saturday 5 September 2015 from 10h00 to 18h00. On Saturday 29 August 2015 from 14h30 to 19h30. On Saturday 1 August 2015 from 14h00 to 18h00. On Saturday 25 July 2015 from 14h30 to 19h30. On Saturday 4 July 2015 from 14h00 to 18h00. On Saturday 27 June 2015 from 14h30 to 19h30. On Saturday 6 June 2015 from 10h00 to 18h00. On Saturday 30 May 2015 from 14h30 to 19h30. On Saturday 2 May 2015 from 10h00 to 18h00. On Saturday 2 May 2015 from 01h00 to 18h00. On Saturday 25 April 2015 from 14h30 to 19h30. On Saturday 11 April 2015 from 14h00 to 18h00. On Saturday 4 April 2015 from 14h00 to 16h30. On Saturday 4 April 2015 from 10h00 to 18h00. On Saturday 28 March 2015 from 14h30 to 19h30. On Saturday 7 March 2015 from 10h00 to 18h00. On Saturday 28 February 2015 from 14h30 to 19h30. On Saturday 7 February 2015 from 10h00 to 18h00. On Thursday 5 February 2015 from 19h30 to 21h00. On Saturday 31 January 2015 from 14h30 to 19h30. On Saturday 10 January 2015 from 10h00 to 18h00. On Saturday 20 December 2014 from 14h30 to 19h30. On Saturday 6 December 2014 from 10h00 to 18h00. On Saturday 29 November 2014 from 14h30 to 19h30. On Saturday 1 November 2014 from 10h00 to 18h00. On Saturday 25 October 2014 from 14h30 to 19h30. On Wednesday 8 October 2014 from 18h00 to 20h00. On Saturday 4 October 2014 from 10h00 to 18h00. On Saturday 27 September 2014 from 14h30 to 19h30. On Saturday 6 September 2014 from 14h00 to 18h00. On Saturday 6 September 2014 from 10h00 to 18h00. On Saturday 2 August 2014 from 14h00 to 18h00. On Saturday 5 July 2014 from 10h00 to 18h00. On Saturday 28 June 2014 from 14h30 to 19h30. On Saturday 7 June 2014 from 10h00 to 17h00. On Saturday 24 May 2014 from 14h30 to 19h30. On Saturday 3 May 2014 from 14h00 to 18h00. On Saturday 3 May 2014 from 10h00 to 18h00. On Saturday 26 April 2014 from 14h30 to 19h30. On Friday 11 April 2014 from 20h00 to 23h55. On Saturday 5 April 2014 from 14h00 to 18h00. On Saturday 5 April 2014 from 10h00 to 18h00. On Saturday 29 March 2014 from 14h30 to 19h30. On Saturday 8 March 2014 from 10h00 to 17h00. On Saturday 1 March 2014 from 10h00 to 18h00. On Saturday 22 February 2014 from 14h30 to 19h30. On Saturday 1 February 2014 from 14h00 to 18h00. On Saturday 1 February 2014 from 10h00 to 18h00. On Saturday 25 January 2014 from 14h30 to 19h30. On Saturday 18 January 2014 from 10h00 to 18h00. On Saturday 18 January 2014 from 10h00 to 17h00. On Saturday 21 December 2013 from 14h30 to 19h30. On Saturday 30 November 2013 from 14h30 to 19h30. On Saturday 16 November 2013 from 10h00 to 17h00. On Saturday 26 October 2013 from 14h30 to 19h30. Draguignan Donnez une seconde jeunesse à votre ordinosaure. On Saturday 26 October 2013 from 10h00 to 12h00. From Thursday 4 April 2013 at 09h00 to Friday 5 April 2013 at 18h00. On Saturday 27 October 2012 from 10h00 to 18h10. From Thursday 23 February 2012 at 19h00 to Friday 24 February 2012 at 00h00. On Thursday 5 January 2012 from 19h00 to 21h00. On Saturday 19 November 2011 from 10h00 to 17h30. On Friday 8 April 2011 from 20h30 to 23h59.